The North Dakota/Montana Bakken may not be the best way to play the United States' unconventional oil. The Williston Basin has high well costs, difficult weather conditions, and insufficient pipeline capacity. Both the middle Bakken and upper Three Forks are deep, which increases costs. Cold winters and spring floods can create a difficult environment for drilling wells or transporting fluids. Bakken crude trades at a significant discount to WTI, and forces some producers to send it by train to areas like St. James which has LLS differentials. Although Mountrail and McKenzie counties have produced some very good wells, it cannot compete with specific areas of the Eagle Ford. We have been hearing these negatives for years, but still the Williston Basin remains an area of interest from some of the world's best oil producers. What is important is its sheer size, and the number of barrels of oil it houses. All these oil producers need to figure out, is how to get a fraction of it out to be profitable. The Bakken formation covers approximately 200000 square miles. To put this into perspective, the Eagle Ford in Texas is 20000 square miles and is broken into three windows. Only approximately one third of this play is considered oil dominant, and only half the play is considered economic. The most expansive shale gas play in the United States is the Marcellus, which covers 95000 square miles. The middle Bakken is not the only way to play the Williston Basin, as there are several pay zones here that are economic. The middle Bakken is not the top oil producer in North Dakota when cumulative historical production is used. Total cumulative oil production through December of 2011 in the middle Bakken is 330,894,036 barrels, while the Madison has produced 923,137,262. The Madison has been a focus of vertical production over the years, and much of this was drilled on and around the Nesson Anticline. Other pay zones include the upper Three Forks which has not been as productive as the middle Bakken, but economic none the less. Below the upper Three Forks are three additional benches. The second bench is estimated to be as good as the first and covers roughly the same area. Continental Resources (NYSE:CLR) and Burlington Resources (NYSE:COP) have both completed productive wells in the second bench. There are tests being performed on the third and fourth bench, but there is little by way of information. The third and fourth benches are spottier in nature, with good and bad areas throughout the Basin. The interesting fact in these lower two is the thought both could be completed with one lateral, but this has not been substantiated. The thickest portion of the middle Bakken reaches 120 feet, while the Three Forks peaks at 270 feet. The Pronghorn Sands has been productive in Billings and Stark Counties. This target was called the Sanish Sands, but recently received the name change. The Pronghorn has been worked by several Williston Basin producers, but Whiting seems to be setting the tone here. In the Mondak area, Slawson has done some work on the upper Bakken. In this area it has measured thickness in the thirty foot range. These wells produce low IP rates but deplete slower and are cheaper to drill and complete. The Red River is also emerging as a new way to play this basin. Operators like Whiting (NYSE:WLL) and Continental are working it in Golden Valley County. This is a vertical play with lower costs. Costs differ significantly from one source rock to another. 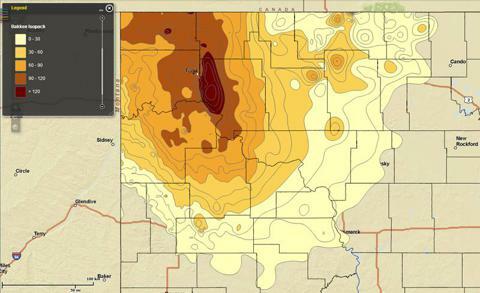 Middle Bakken well cost range is $9.5 to $10.5 million in deeper areas. These wells will produce estimated ultimate recoveries or EURs in the 750 to 900 MBoe range. Red River well costs are in the $3.2 to $4.0 million range and produce EURs of 200 to 400 MBoe. It has been reported that the Red River play extends from Wibaux north to Sheridan counties in Montana. It has been rumored that Samson Oil and Gas (NYSEMKT:SSN) has accumulated acreage in Bottineau County for the purpose of working the Mission Canyon and Nisku formations. There are a significant number of targets and we should obtain clarity as these plays become economic with the rising price of oil. Continental's acreage is probably the best way to identify premium Bakken acreage. It could be said that Continental has acquired better acreage than any other producer when the scale of its acreage is considered. 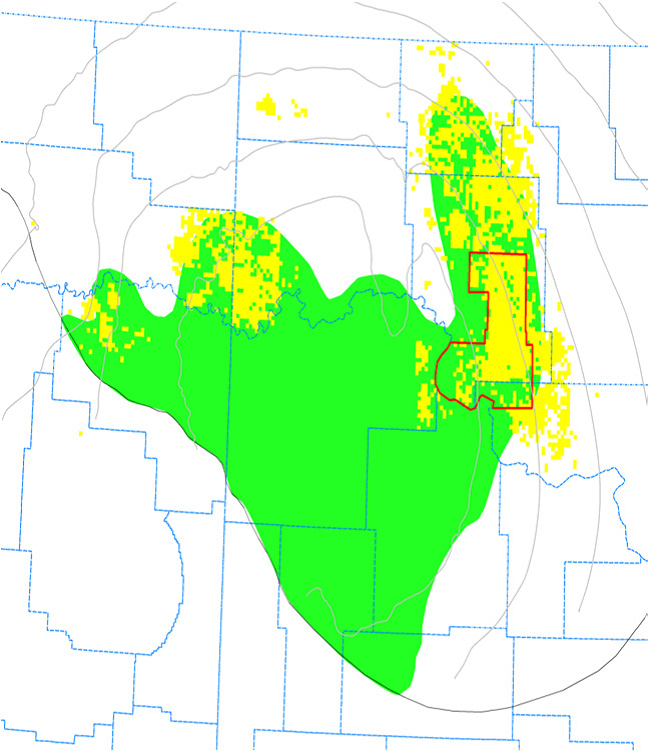 The core of its acreage (green/yellow) runs in a north to south configuration from southeast Divide to northwest Dunn. Above in green is Continental's acreage that is held by production, while the yellow is not. It has focused its program identifying good acreage on and around the Nesson Anticline. Its core Montana acreage was done in the same fashion, with the majority of acreage being located in the Elm Coulee Field. This has been a very good plan as many of the best Bakken wells have been in northeast McKenzie and western Mountrail counties. Although there have been many upward revisions, currently Continental gives average North Dakota middle Bakken EURs of 608 MBoe. This says little about specific areas, but gives an idea of total resource to be garnered. Kodiak Oil and Gas (NYSE:KOG) is another way to play the Bakken. It developed its completion style while working the non-operated end of a JV with XTO Energy, a company purchased by Exxon Mobil (NYSE:XOM). Kodiak is known for using the best well design, and has helped to elevate the company to one of the best producers in the Bakken. The picture below shows Kodiak's prospects in North Dakota and Montana. Initially the Street believed Kodiak's best acreage was in Dunn County. There is no doubt this is good acreage, but its initial Koala wells helped to show an area as far away as Banks Field could produce even better EURs. Dunn County has been good to Kodiak, and with exception of the Charging Eagle, has EURs of 800 to 900 MBoe. Upper Three Forks EURs in Dunn have been 700 MBoe. Its Koala and Polar prospects share this EUR while Smokey Prospect wells produce an estimated 750 MBoe. 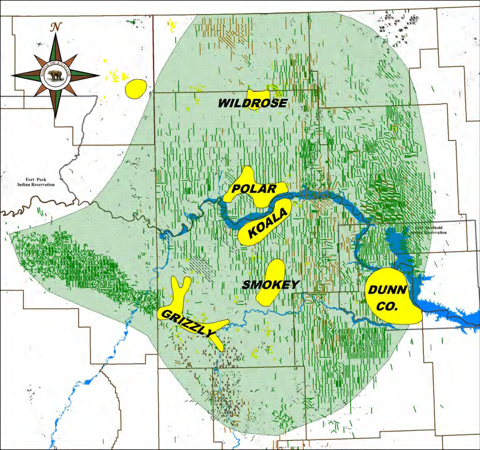 The Wildrose and Grizzly prospects have lower EURs and will not be developed in the near term. 450 MBoe is expected in these areas. The Wildrose is interesting as it's shallow and the source rock is very thick. Wildrose is held by production, and will be developed at a later date. Production from its recent wells show the prospect is economic, but other better areas will be developed first. Above is EOG Resources' (NYSE:EOG) acreage in North Dakota and Montana. The area outlined in red is its core acreage in and around Parshall Field. Much has been said about EOG's success, or lack thereof in the Bakken. This has been created through confusion from lower IP rates. 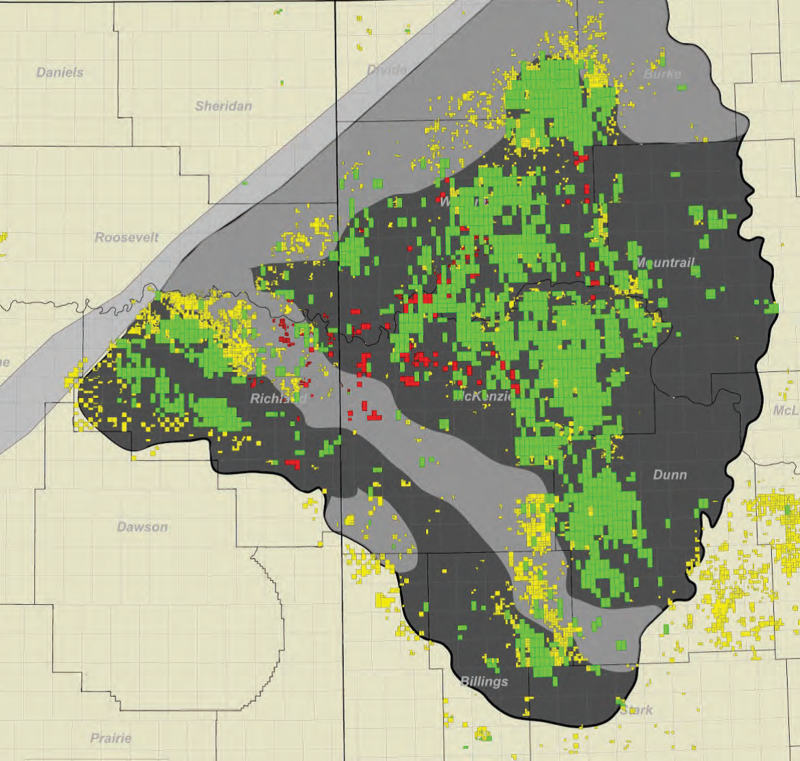 EOG has developed much of its acreage using short laterals. Laterals range from 4500 to 6000 feet as opposed to the standard 9000 to 10000 feet, as seen with the majority of other producers. Outcomes appear to be sub par, but in reality the exact opposite has occurred. On a production per foot basis, EOG has better results than any other company in the Williston Basin. In Parshall Field it has produced EURs in the 450 to 500 MBoe on one mile laterals. That is the equivalent of 900 to 1000 MBoe using a two mile lateral. Much of this acreage is east of Nesson, and very good. Its Stateline/Diamond Prospect is in west Williams County. This area is also being worked by Oasis (NYSE:OAS) and Halcon (NYSE:HK). EOG Resources has begun waterfloods with very good results in Parshall Field. Depending on the results, it could change the scope of total recoveries. In summary, Williston Basin EURs can very significantly from one area to another. Identifying these recoveries becomes more difficult from one source rock to the next. The middle Bakken has been so successful that other pay zones are being identified at a much slower pace. The Sanish and Parshall fields were once thought to be best in play. Brigham's work in Alger Field outperformed and we began to understand these economics extended into other areas. Southwest Mountrail and northeast McKenzie counties continue to outperform, but are not the only good areas. Differentiating well results depend on a large number of specific variables. These variables must be isolated to see its effect on initial production, EURs, and well cost. Kodiak's Koala wells have been great, while Continental had lower results in the same area. When I broke down the results Kodiak's lateral length and number of stages did not differ much from Continental's. At the time Kodiak had spent around $11 million, while Continental spent $8. The big difference was that Kodiak spent more money to use more water and proppant. The type of proppant was important as well, as it used ceramic proppant while Continental used only sand. After 90 days of production Continental's well depleted at a greater rate. The 90-day IP rate for Kodiak's well produced EURs of 1000 MBoe, while Continental's well produced 700 MBoe. Continental spent $3 million less, but over the next 32 years will produce 300000 less barrels of oil equivalent. Results like these substantiate spending more per well, and we should continue to see these wells cost more and improve production. Many of the smaller producers that had difficulty in getting good results have sold, and we will continue to see this consolidation going forward. Large cap oil companies will continue to purchase acreage and in other unconventional plays like the Eagle Ford. This is a certainty as growth in oil production is very difficult to find, and many of these plays will continue to produce oil for decades. Timing is everything and in the end it all comes down to the price of oil. Disclosure: I am long KOG. I wrote this article myself, and it expresses my own opinions. I am not receiving compensation for it. I have no business relationship with any company whose stock is mentioned in this article. Additional disclosure: This is not a buy recommendation.